Tone is set from the top, they say. I once started a company and ran it for 10 years, but I rarely thought about leadership, let alone setting the tone. It mattered little, since I was the sole employee for most of that time. Now I ponder these topics a lot, as I watch leaders fail to consciously create and promulgate an ethical organizational culture. I don’t mean they’re unethical, though some might be. I mean they, like me, never gave it much thought, or recognized its importance. This myopia degrades long-term prospects, leaving employees and partners to invent and impose their own interpretations of the organization’s nature, motives, and goals. Without a clearly-defined direction, people make their own way, and despite the best intentions, those ideas surely don’t quite align with the underpinning ideas and expectations of leadership. Next time I find myself in the position to shape an organization — found a company, create a new group, organize a team — I will give careful thought to these issues, and formalize them in foundational documents that provide focus and direction for the duration. A sort of Organizational Constitution. And like any constitution, its articles will both set the tone and encode the rules. Culture establishes an environment in which members of the organization feel cared about, respected, valued, and physically and psychologically safe; where they understand what they’re a part of and fulfilled by their roles. Culture recognizes what people can contribute, and finds ways to let them do so. It lets them know there’s a place for them, and that they actively contribute to the Mission. Culture cannot be legislated, of course, but a preamble announces intentions, sets the tone, and establishes the foundation on which the rest follows. What problem are we solving for the greater good? Who and what are we inspiring to change? Closely aligned with Values, the Brand defines the organization. The brand commits to the Values, Vision, and Mission, recognized both internally and externally, so that anyone can say what the organization stands for and how it goes about achieving its goals. Decisions that might erode the Brand or violate its underpinning Values must be avoided. The Mission is the “what”; the Strategy is the “how”. The Strategy describes how the organization intends to execute on its Mission to achieve its Vision. It should be high-level but practical, goal-focused but not methodologically imperative. It defines objectives that clearly demonstrate value for existing and prospective constituents (customers, users, etc.) while adhering to — and never corroding — the organization’s Values and Vision. Everyone in the organization should be aware of what the Strategy is, what its objectives are, and how it furthers the Mission while adhering to its Values. Recognition of and continual reinforcement of the Strategy and objectives creates focus, providing a guide for decision-making. Ultimately, Execution means delivery. It requires meaningful goals to fulfill the Strategy and the achievement of its objectives: shipping product, meeting deadlines, effectively promoting products and solutions, and acquiring happy constituents who enjoy the fruits of the organizations, who derive benefit and value from them. The organization Structure must enable it to effectively execute the Strategy. That means cohesive teams with with clear mandates and the focus and autonomy to effectively execute. Strong coupling of deliverables across teams ought to be minimized, but expert consultation should be provided where needed. Everyone in the organization should be aware of the Structure, and understand their roles and the roles of other teams. Leadership must be aware of all of the above tenets and invoke them them regularly. Speak every day about what the organization believes in (Values), what it wants to see in the world (Vision, Mission), and how it contributes to making that world (Strategy, Execution). Communicate consistently and constantly within the context of the products made and services provided — toward the output of the Strategy, the organization’s deliverables. Demonstration of the alignment of the Strategy to the Values of the organization must be continuous, and always consulted when making decisions. This Communication must be verbal, but also written. Guiding documents must outline all of these aspects, and tie all the pieces together. So in addition to the constitutional articles that define the Values, Vision, Mission, there must be living documents that articulate the Strategy for achieving the Vision and Mission. These includes road maps, planning documents, specifications, promotional plans and materials, organizational structure, team and role definition, etc. 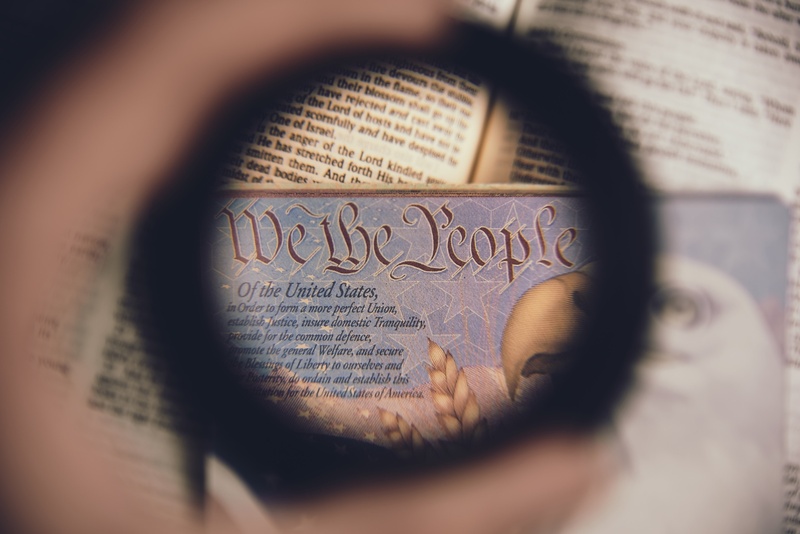 Inconsistency of these articles abounds in the business world, since companies seldom convene a constitutional convention to create them — but sometimes because internal- and external-facing messaging varies. It need not be the case. Perhaps working through these topics with a team will help constitute the grounds on which the organization functions and presents itself to its members and the world. Even if some members disagree with or are indifferent to some of its tenets, all will appreciate the clarity and focus they engender. And an organization with purpose gives its members purpose, meaning to their work, and satisfaction in the furthering of the mission.